Landsat 8 cloud band: how to understand their (bit) coding? I am trying to understand how to use the Lansdat 8 cloud quality band. 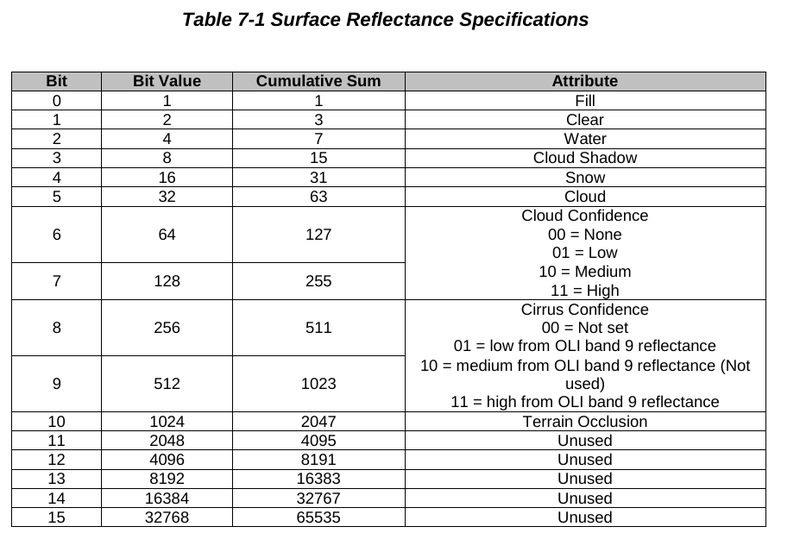 The user guide L8_Surface-Reflectance-Code-LASRC-Product-Guide.pdf does not explain much, but just gives tables (Table 7-1, 7-2 and 7-3) I don't really understand how to read those, and how to use them. Browse other questions tagged landsat-8 cloud-cover or ask your own question. Removing cloud cover on LandSat 8 imagery using ArcGIS for Desktop? What bands should be used to identify clouds using the cloud function of the landsat package in LANDSAT 8 scenes?